Lately coding has become a buzzword in education especially in the community that I teach. The parents are showing a lot of interest in their children learning how to code in schools. One solution to this is through the web based program Scratch. This program allows students to gain coding experience in a fun and interactive way. The students may not be coding Java or HTML but they are coding their characters to do incredible things. This is a great way to introduce students to coding, and I have seen many students extremely enthusiastic about the program. At first I thought this is a great program, but I won't be able to use it in my Spanish classroom where speaking is the main focus. After collaborating with a colleague I realized that not only could the entire scratch program website be in Spanish, but that my students could also record their voices right in the program. 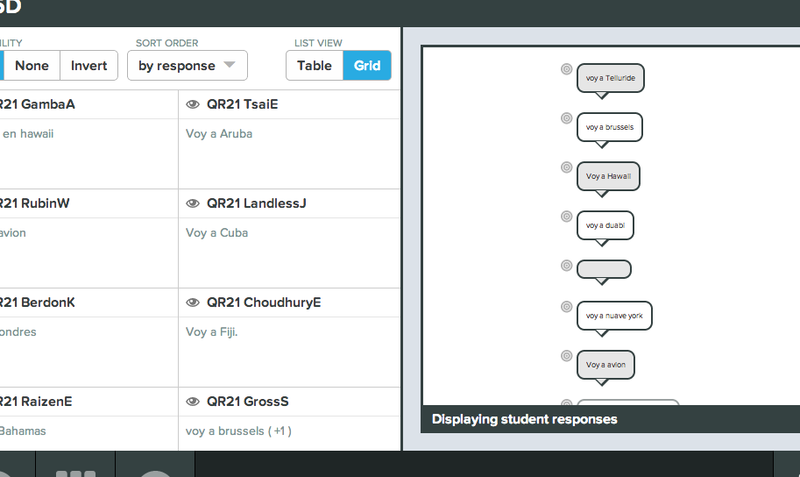 We realized that this is a great way to have the students practice their language skills by creating, and coding a conversation between two characters. The tip with this part is to have students insert code for one line of the conversation, then to put the code in for the other character. The other character can have code inserted to trigger an audio response to the first character. This creates a conversation in Spanish between the two characters. My 3rd grade class absolutely loved using scratch! The students picked up the program incredibly fast, and found it to be a fun challenge. In the first class the students chose their "Sprites" which are characters. They then chose the setting background. We then had them use code to record their conversations. The students would record and code one part at a time. This takes a lot of concentration and precision, that being said, my class of 3rd graders was very capable of such a challenge. The first class in the computer lab the students were able to begin coding and record some of their conversation. The next class we will be finishing up and exporting the finished coded recordings. Please read before trying out Super Quiz for automatic feedback! 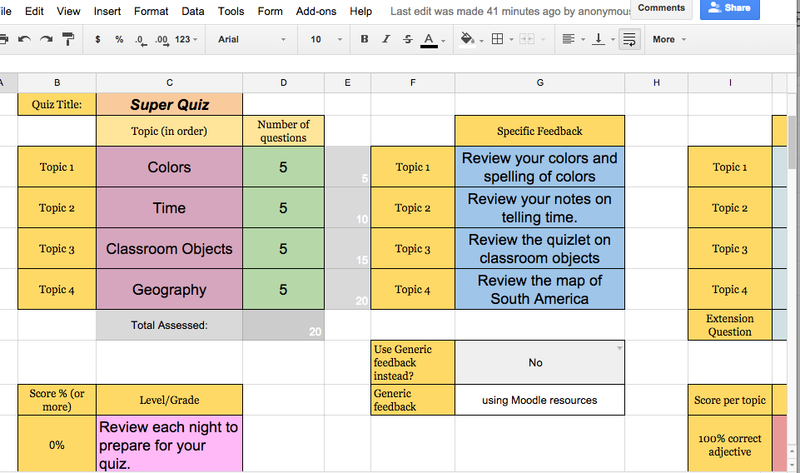 Super Quiz worked incredibly to automatically grade quizzes on google forms. 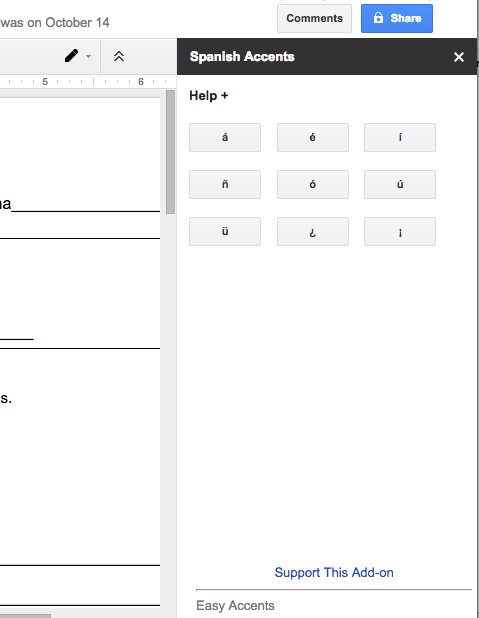 The script sent out a google doc to all of my students with a report of how they did on their form just as planned. Automatic feedback and documents must be approached with caution when dealing with graded tests. The experience taught me a lot, and I think that it is really important to read about my experience before you use Super Quiz with your students. 1. 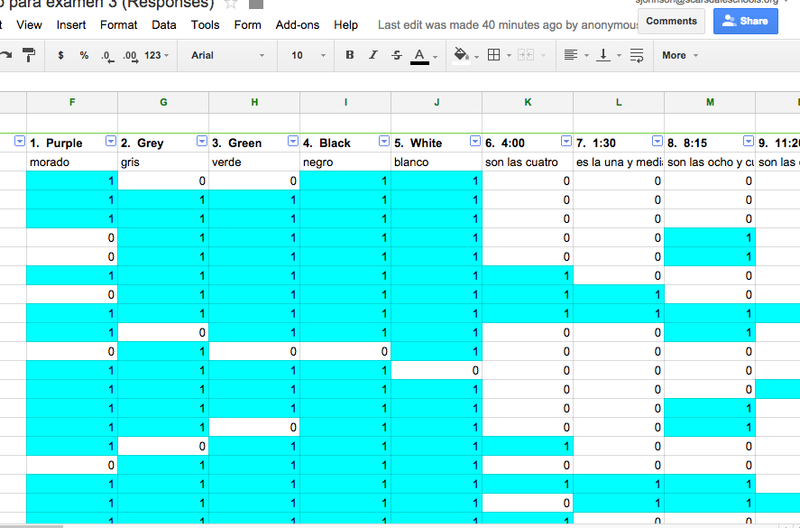 Make sure you have edited all of the tabs within google sheets before any student has taken the quiz. +O Trussell has created the amazing script which makes Super Quiz function. He has also configured the grading scale in the tab "auto feedback configuration." It is very important to change these settings to match your grading scale and feedback that you would like for your class. The mistake that I made was leaving the letter grade system which was there by default. It caused students who got 18 out of 20 questions correct to get a B. This ended up causing a lot of issues after the grades were automatically sent to each student. Many students and parents were distressed by letter grades much lower than where they should have been. Please be very careful in editing this part because it is very important for the auto feedback documents. 2. My advice would be to first try out Super Quiz on a homework assignment or class assignment before counting it as a graded test or quiz. If you do use it for a graded quiz or test be extremely careful with the grading scale. Remember partial credit is not possible on these questions. The bottom line is that the script works and the majority of my students were very happy to have a report sent to them right after taking their quiz. Just be very careful as to what feedback gets immediately sent out to your students! Recentemente eu viajei ao exterior. A maioria do tempo eu fiquei em lugares sem internet, por iso eu tinha a oportunidade de procurar aplicações muito bons para meu tablet e smartphone. Eu procurei três aplicações excelentes que funcionam sem conexão ao internet. Eu usei os aplicativos duolingo, Google Docs & PIXLR Express. Estes melhoraram bastante minha experiencia. Duolingo foi incrível para praticar a língua francesa enquanto viajava pela França. O aplicativo é excelente porque para avançar precisa escrever, falar, e escutar a língua. Antes eu quis aprender a língua com Podcasts e livros, mas este aplicativo te faz praticar de todas formas. Eu gosto muito como cada lição é como um nível de um vídeo-game, não sente que está estudando, sente que esta jogando um vídeo-game. Depois de bajar o aplicativo e selecionar a língua que você quer aprender, não precisa de internet para fazer as aulas. Para editar todas as fotos que eu estava tirando usei o aplicativo PIXLR Express. O aplicativo tem muitos efeitos para melhorar suas fotos. Tudo é muito fácil de usar e também você pode guardar-las em seu Google Drive. Com este aplicativo você pode criar seus própios cartões postais sem gastar um real. Foto que tirei do nosso hotel em Tangier editado com PIXLR Express. Eu adoro escrever sobre minhas experiencias durante minhas viagens. Para mim um diario é a maneira perfeita para lembrar-se dos detalhes pequenos de uma viagem e para fazer um diario usei o aplicativo Google Docs. Com Google Docs eu pude escrever desde meu tablet e Smartphone sem internet. Você pode usá-lo no modo "Off-line" apenas você clica na informação do documento e depois clica em "Manter no dispositivo." Na parte de detalhes diz se seu documento esta mantido no dispositivo. Você sabe se o documento esta mantido em seu tablet ou Smartphone se vê a caixa azul do lado do "Manter no dispositivo." Agora você pode escrever a partir qualquer lugar sem internet. Depois quando vocês tiverem internet o documento vai estar guardado no google drive de novo. Las tres mejores aplicaciones gratis para viajar sin internet. Recientemente viajé al extranjero. La mayor parte del tiempo estuve en lugares sin internet, gracias a ésto tuve la gran oportunidad de encontrar aplicaciones muy buenas para mi tableta y Smartphone. Encontré tres aplicaciones excelentes que funcionan muy bien sin conexión al internet. Usé las aplicaciones duolingo, Google Docs & PIXLR Express. Éstas mejoraron mi experiencia bastante. Duolingo fue excelente para practicar la lengua francesa mientras viajaba en Francia. La aplicación es excelente porque para avanzar necesitas escribir, leer, hablar, y escuchar el idioma. Antes intenté a aprender el idioma con Podcasts y libros pero esta aplicación te hace practicar de todas formas. Me gusta mucho como cada lección es como un nivel de un videojuego, no sientes que estás estudiando, sientes que estás jugando un videojuego. Después de bajar la aplicación y seleccionar el idioma que quieres aprender, no necesitas internet para hacer las lecciones. Para editar todas las fotos que estaba tomando usé la aplicación PIXLR Express. La aplicación tiene un montón de efectos para mejorar tus fotos. Todo es muy fácil de usar y también puedes guardarlas en tu Google Drive. Con ésta aplicación puedes crear tus propias postales sin gastar un centavo. 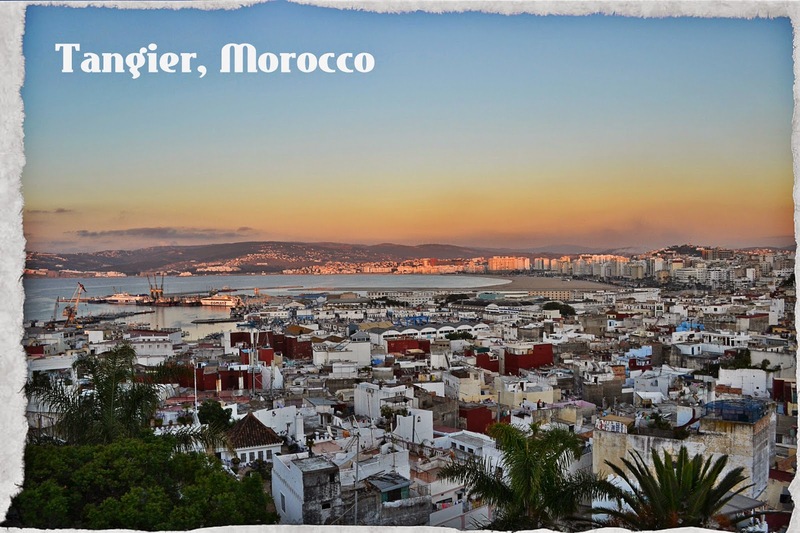 Foto que saqué desde nuestro hotel en Tangier editada con PIXLR Express. Me encanta escribir sobre mis experiencias de mis viajes. Para mí un diario es la manera perfecta para recordar los detalles pequeños de un viaje y para hacerlo usé la aplicación Google Docs. Con Google Docs pude escribir desde mi tableta y Smartphone sin internet. Puedes usarla en el modo de "sin conexión" Solo da click a la información del documento y después da click a "Guardar en dispositivo"
En la parte de detalles dice si tu documento esta guardado en el dispositivo. Sabes si el documento esta guardado en tu tableta o Smartphone si ves el cuadro azul al lado de "Guardar en dispositivo." Ahora puedes escribir desde cualquier lugar sin internet. Cuando tengas conexión de internet el documento va a estar guardado con los cambios en tu Google Drive. Google Docs fue perfecto para escribir un diario en cada momento de mi viaje y guardar detalles importantes como reservaciones de hoteles y tours sin tener que imprimirlo en casa. While on recent trips to countries I found myself numerous time without internet access. It made me realize that there are many great applications that do not require an internet connection to function. I was able to use three great applications on my tablet and smartphone that did not require the internet but greatly enhanced my trip. The three Apps were duolingo, Google Docs, & PIXLR Express. Duolingo came in handy for practicing French while traveling through France. The App is great because it incorporates learning a language through listening, speaking, reading and writing. I was previously only reading textbooks, and listening to Podcasts but duolingo really helped improve my writing in French. The App provides lessons in a gaming format making each lesson similar to a video game level once the App is downloaded you can use it without internet. 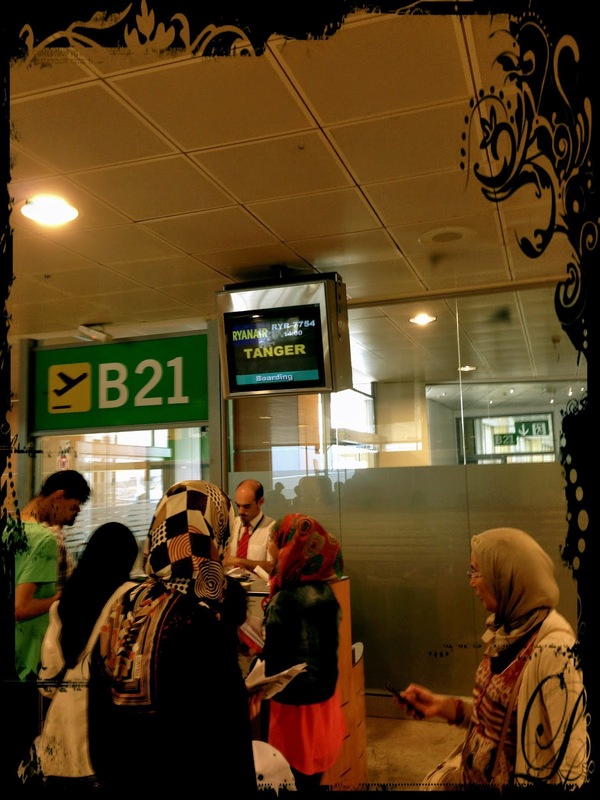 The lessons are in short ten minute portions which make it perfect to an activity during downtime while traveling. As for editing pictures I really like the App PIXLR Express. The App has countless effects that can be added to pictures. It makes editing extremely easy and with the ability to save pictures onto GoogleDrive. Here is one that I edited from Morocco. Lastly what better way to remember a trip than to write a journal? The Google Docs App makes for the perfect digital travel journal. Google Docs allows you to type offline by just clicking on the info for a document and then checking off "keep on this device." Once checked off you can now type anywhere and the document will be saved on your device. As soon as you reconnect to the internet the document saves itself onto Google Drive. Google Docs was the perfect way to write freely on the go without worrying about losing your work. Como Profesor de español siempre estoy buscando maneras nuevas de grabar audio y video con mis estudiantes. Para un maestro de idiomas es muy importante evaluar la pronunciación de los estudiantes al momento que estan leyendo. La aplicación de Screencastify con la extension de Google Chrome hace possible grabar audio y videos haciendo una actividad interactiva y muy divertida para la clase. El primer paso es descargar la extensión de Screencastify desde la tienda en línea de Google Chrome. Ya estando en la tienda en línea escribe en el buscador “Screencastify” los resultados en la página apareceran como en la foto de la parte posterior. Una vez que haya sido añadida la extensión aparecerá en la esquina derecha del buscador de Google Chrome y se verá como una tira de película. Para usar Screencast simplemente da click en la tira de película y verás el menú para comenzar a grabar. ventajas sobre cualquier otra aplicación del internet. Una vez que el screencast ha sido grabado, se puede compartir con el profesor o cualquier otra persona. Ésta aplicación pone en las manos de los estudiantes la oportunidad de hechar a volar la imaginación y crear un trabajo que nunca se perderá y podrá tener acceso desde cualquier computadora. Para hacer uso de ésta aplicación en mis lecciones, les pedí a mis estudiantes que agregarán la extensión a sus chromebooks, después de haber escrito lo que se les asignó en español, cada estudiante utilizó screencastify para grabar su párrafo correspondiente. Mis estudiantes después compartieron su screencast conmigo para evaluar su escritura y pronunciación. Los screencasts hacen posible la evaluación tanto oral, como escrita con todos los beneficios que aporta Google Drive. Ahora puedo abrir el screencast en Google Drive y publicar comentarios para que el estudiante los pueda ver. Los videos se pueden descargar ,guardar en la computadora ó directamente en código para páginas web. En la parte posterior puedes ver uno de los screencasts de mis estudiantes. As a Spanish teacher I am always looking for easy and efficient ways to record my students to assess if they are improving there pronunciation and reading of the language. Screencasting with the Google Chrome extension Screencastify makes audio recordings and screen videos a great classroom activity. The first step is to download the extension from the google chrome webstore. 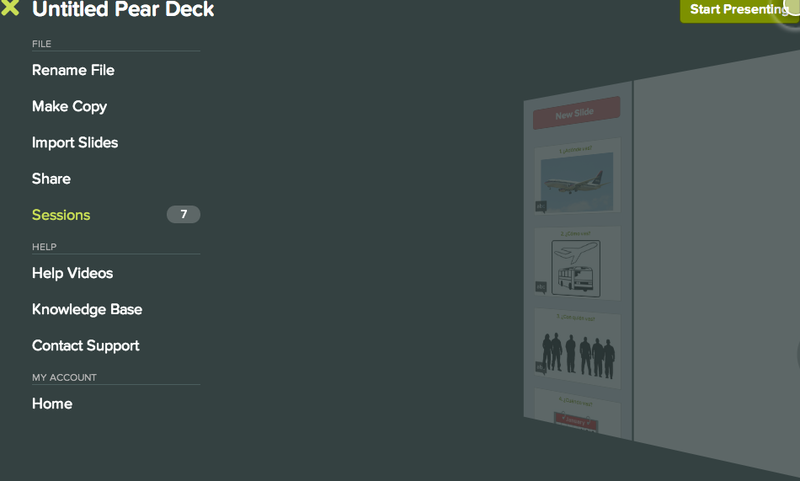 In the webstore search option type in "Screencastify" your results page should look like this. Once you add the extension it will appear at the top right of your chrome browser and look like a film strip. To use this extension simply click on the film strip and you will see a menu to start recording. 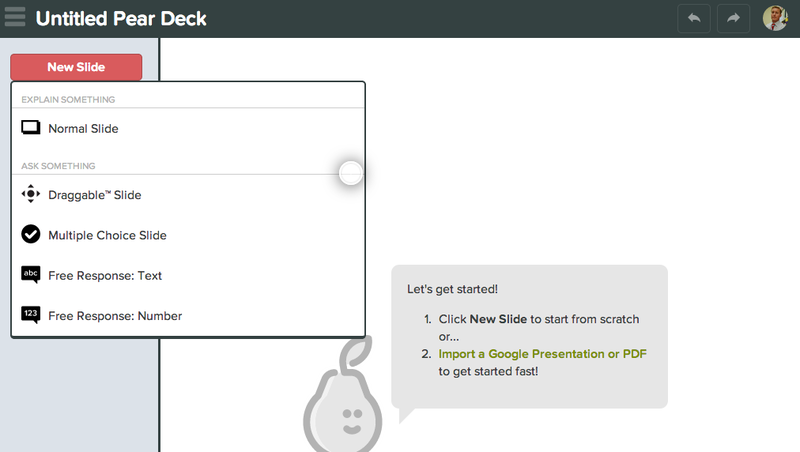 My favorite parts about using Screencastify is how easily you can create a screencast and upload it right onto your Google Drive. 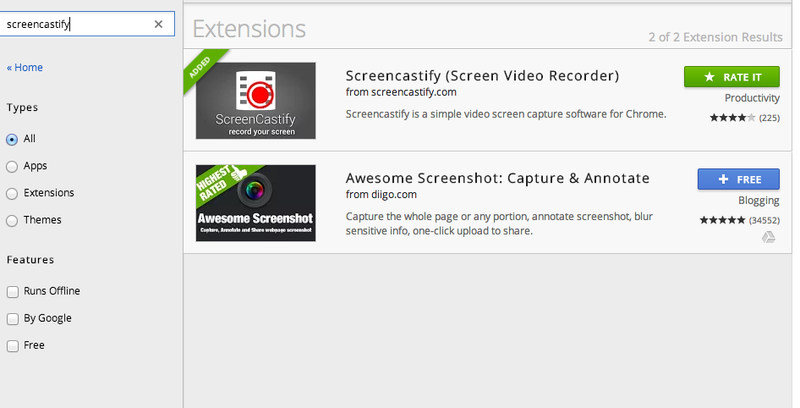 This is by far the greatest advantage to creating screencasts with Screencastify over other apps. Once a screencast has been recorded the student can now share it with the teacher. This really puts the power of creating work in the hands of each student and provides a simple way to make sure that the work will not be lost. To use this in my lesson I had students add the extension on their chromebooks, then after typing up their assignment in Spanish, students used screencastify to record them speaking their paragraph. The students then shared their screencast with me so I could assess both there writing as well as their speaking. Screencasts make an oral and written assessment possible with all of the benefits of Google Drive. 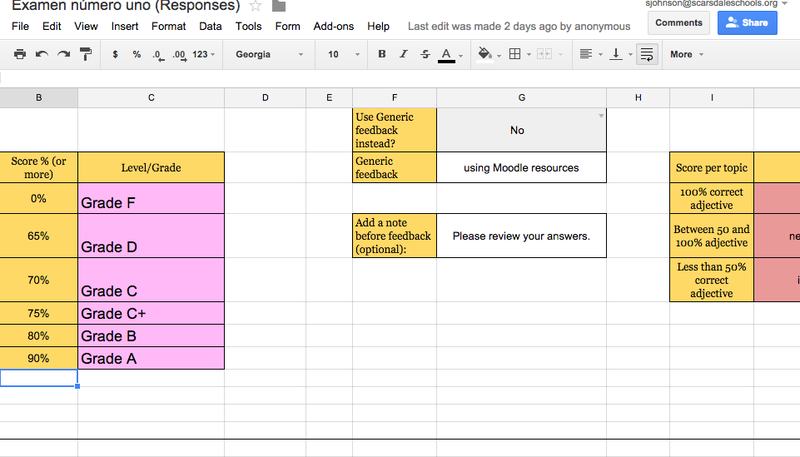 I can now open up their screencast in Google Drive and post a comment about their screencast for the student to see. The videos can then be downloaded and saved on a computer or imbedded into a website. 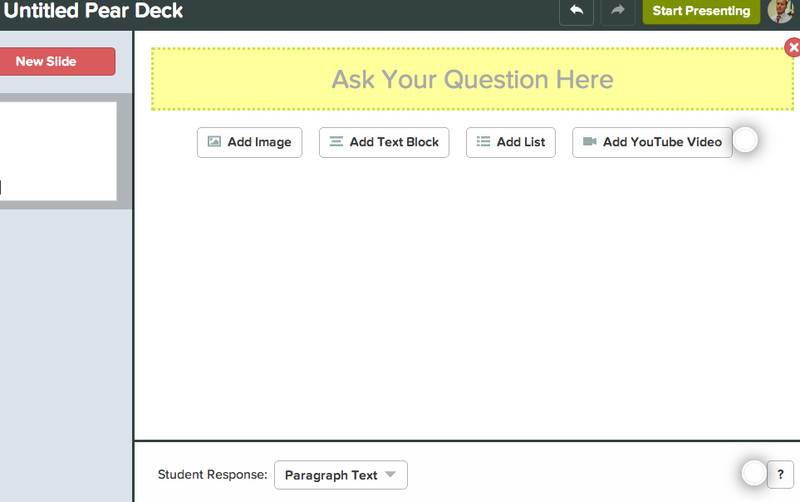 Check out one of my students screencasts to see what a screencast can look like. Teacher Dashboard makes paper obsolete in my Spanish classroom. I can pass out copies of digital presentations, documents, photos and folders into each students Google Drive. I first began using the program last year to check on the work students were doing. I realized that this program was a great way to access everything students were doing in their Spanish folder of their GoogleDrive. 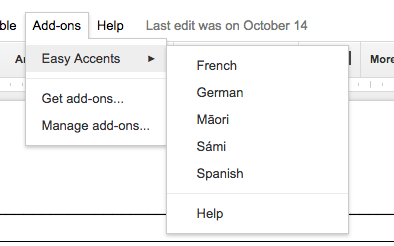 I have now realized that I can send out any document I create in my GoogleDrive as a copy for each student to have. This has allowed my students to have the template for the class which they can add their work to. The best part is that I then have access to each one of their assignments to check on their progress. 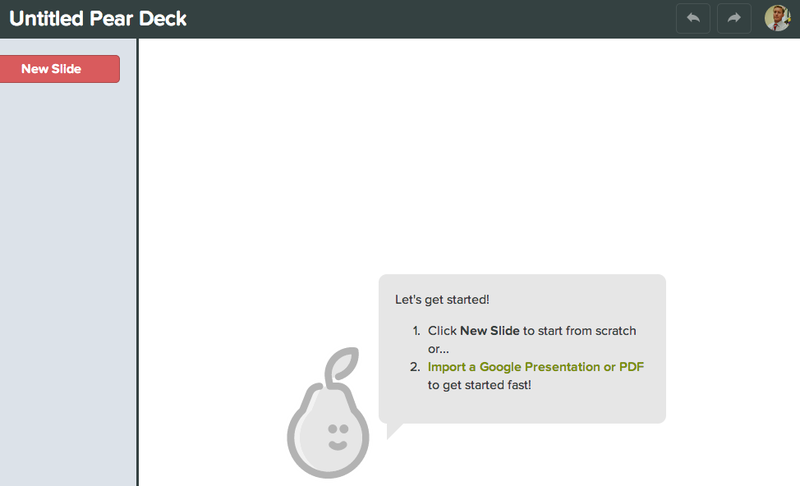 This has been a great way to copy documents, presentations & spreadsheets. This is what my Teacher Dashboard homepage looks like. It lists all of my classes and make it very easy to access the specific class I want. After clicking on a class I can see each student and all of their folders. I can then click on a specific folder and see every item in their folders along with when it was last edited. If I click on a document a new tab will open up within my chrome browser and I will have access to it. 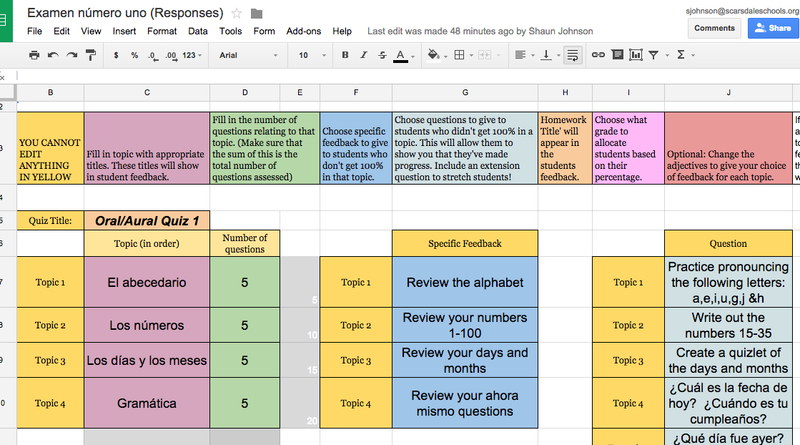 This is an excellent tool to keep track of student progress. The most productive part comes when you make a copy of a presentation, document or spreadsheet from Google Drive and place it right in each students Spanish folder. It makes the classroom paper free, because each student gets their own copy. I now can review their work before they hand it in as well as monitor student progress on the work. Teacher Dashboard has been a huge help when organizing work to give to students. I now know exactly which handouts students have as well as what work they have done on their handouts.